This 17th century timber framed house has a multi angled brick chimney stack. The small extension still has a high gable showing the roof used to be thatched. Inside one of the fireplaces a sealed pottery witch bottle containing nails and copper alloy pins was found. It was believed that this would confine evil spirits, protecting the house, until the bottle was opened. E. Rose (NAU), 25 April 1985. In one of the two back to back fireplaces in off centre stack, a Bellarmine witchbottle found. W. Milligan (NCM), 22 May 1986. The bottle contained iron nails and copper alloy pins and was below the hearth in the western fireplace. Fireplace is between oven and stair. W. Milligan (NCM), 8 May 1986. 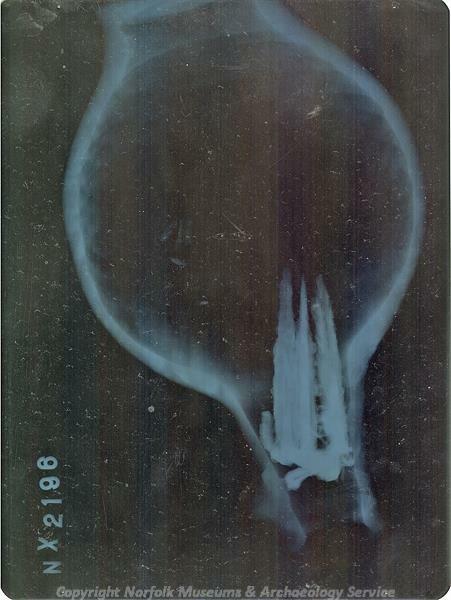 <S1> Photograph: X ray. NX 2196 to 2197.